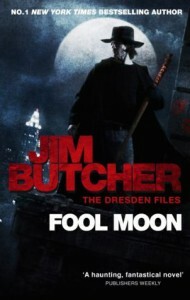 I enjoyed the first Dresden book much more than this one. To me, Fool Moon felt rather "checklisty," like Butcher was making sure we saw every single category of werewolf Bob had mentioned in his discussion with Harry early in the novel. The whole book felt disjointed, in my opinion, but I can't share the prime example without spoiling the climactic scene. Before I started the Dresden series, I was warned by several friends that the first four titles are a bit weak, and then the books improve significantly, so I'll assume this was one of the rough patches and keep going.